View of Laxton from the Dovecote Inn. Laxton is a parish in central Nottinghamshire, in Newark and Sherwood District Council. It is about 4,000 acres in extent. The village lies roughly in the centre of the parish, with a hamlet (Moorhouse) on the eastern extremity. It is bypassed by the main road from Ollerton to Tuxford. In 2011 the population of Laxton, with its hamlet of Moorhouse, and the adjoining Egmanton (with no distinction between them) was 449. The name is recorded in Domesday Book as Laxiintone, and may derive from the Anglo-Saxon Leaxingtūn meaning the ‘farmstead or estate of the people of a man called Leaxa’. It has never been served by either a railway or a waterway. The remains of a medieval motte and bailey castle can be found on the north side of the village. The castle, which was probably more earthwork than stone, was redundant by the end of the Middle Ages, and by the 1630s a manor house had been built in the grounds where it had once been. In tutnr the manor house was demolished, but visitors can still visit the site and see the outline of the castle. 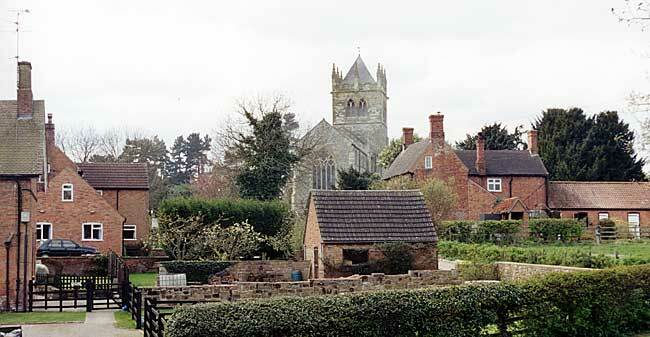 In appearance, Laxton is not unlike many other villages in the county, predominantly red brick houses with pantiles, a stone built medieval church, St Michael and All Angels (largely restored in the 19th century), a public house (the Dovecote Inn) which does a good business with locals and with people from neighbouring villages as well as Newark and further afield, and a small village shop. The nonconformist chapel has long been closed, and there is now no school. The old school building was for many years a library, and is today the village hall. There is a Women’s Institute and a cricket club, which plays on a field on the northern side of the village. Laxton has one distinguishing characteristic which makes it unusual: it still has its open (or common) agricultural fields, with a working manor court. The system of farming, although it has been altered and developed over time, is still based on principles which were once found throughout the lowland areas of northern Europe, and are sometimes known as the three-field (meaning three rotations), system. It is a system where the farmers work in common and their work is overseen by an annual court. The structure of the open field system was developed in the Anglo-Saxon period in order to maximise farm output and to minimise risk. The land was claimed back (the technical term is assarted) from the waste, and put under cultivation. Each tenant of the manor was allocated some land (a strip) as each area of waste was brought under cultivation, in the form of furlongs, which eventually became (collectively) a field. Laxton developed four fields, the last of which had been laid out by 1232. In this way each tenant of the manor had strips in each of the furlongs and each of the fields. To make the system work, the farmers had to operate ‘in common’, and what they developed was a three-course rotation. Over time, one course came to be predominantly wheat growing, one to be a mixture of barley, peas, oats and other crops, and the third in fallow. Two of the four fields, the West Field and the East Field, were worked together, hence a three course rotation in four fields. The fallow was crucial because if land was cultivated too frequently, it lost its fertility and productivity fell. So although the farmers found it very frustrating, one third of the land was left in fallow each year, so that the nutrients in the soil could be restored. To keep watch over the system, the manor appointed a court. The court had two functions, to oversee the occupation of land within the manor and thereby to ensure that farms were handed down from generation to generation, or to nephews and other relations if the direct line of a family failed, and second to oversee the operation of the common fields. To do this they held, and still do in Laxton, an annual court day, when the jury (a group of farmers appointed by the court) inspect the fields to make sure everyone is working together appropriately. Farmers found to have ploughed in the wrong places, or to have allowed drains to silt up, as well as some other offences, are fined. Following the inspection of the fields, the farmers record all the offences spotted in the common fields in a document called a Presentment Paper. A week later they gather together in the court itself, with the Lord of the Manor’s bailiff (a Newark solicitor) chairing the meeting. His responsibility is to keep order, to ensure that all the tenancy transfers are properly acknowledged and recorded (although this is no longer required in practice), and to implement the fines which had been agreed a week earlier. The court is in many ways an anachronism but the farmers treat it very seriously and fines are both levied and paid. The survival of the system has had other repercussions. In Laxton today there are fourteen full-time and four part-time farmers. No other village in Nottinghamshire has anything like so many farmers, because in the past century or so the business of farming has changed completely. In many villages there may be only one or two farmers, and they are likely to live in large farmsteads outside of the village core. Instead, many village houses have been sold to newcomers, perhaps retired couples, or holiday makers. Laxton is not like this. You can walk along the main street today and still see working farmers. The farming system has had to change. In the early twentieth century the strips were widened to allow farm machinery into the fields, particularly reaper-binders and subsequently combine harvesters. The old ridge and furrow, the corrugated effect that can still be seen in the landscape across much of England, has had to be ploughed out in order to use modern tractors, and the farming system has been altered to fit in with the demands of the modern European Community. At one time all the farmers would have had sheep and cattle as well as their agricultural land, but that is no longer the case because it is not profitable to keep animals. Some of the modern farmers work in the fields only part-time and do other work for much of the week. So what you can see in Laxton today is not the same as would have been the case in the distant past, but the principles on which the farmers work are the same as in medieval and probably late Anglo-Saxon England. We know the system has been operational since at least 1650 because we have records going back that far. Why has it survived? The common field system was increasingly outdated over the centuries, and in village after village it was agreed to reorganise the fields into individual holdings (technically known as enclosure) which the farmers preferred from a farming point of view, and the landlords preferred because they could charge higher rents. An important part of this movement was the Parliamentary Enclosure period from 1760-1830. Laxton survived, not because it was thought worthy of survival as such, but because the major landowner, Earl Manvers of Thoresby Hall, could not afford to enclose the parish. By the end of the nineteenth century, agricultural depression had placed a premium on small farms, and this made Laxton attractive. The result was that from the First World War onwards, Laxton has been kept as an open field village. Earl Manvers sold it to the Ministry of Agriculture in the 1950s, and today it is owned by the Crown Estate Commission. It is not a museum, but visitors are welcome. They can go to the Visitor Centre and see the exhibition, and watch a DVD about the farming system. They can also buy a guide book which not only explains the how the farmers operate, but also provides information on walking the fields to see more of how this survivor of a system which was once found across much of Europe, still operates. It may not be quite what it once was, but Laxton remains a remarkable example of a system of farming which was once crucial to maintaining profit for the farmer while he produced sufficient food to feed not only himself and his family, but also people living further afield, perhaps in towns, who were worked in manufacturing and other activities away from the countryside. On the western side of the village, in buildings originally laid out as a separate ‘enclosed’ farm in the 1720s, is the Beth Shalom Holocaust Memorial Centre. Opened in September 1995, this was the first venue in Britain dedicated to understanding and remembering the Holocaust. It has a purpose built exhibition centre with lecture theatre, and a Memorial Garden. The names of all the Nazi death camps are inscribed on a black stone. The centre is houses the Aegis Trust, which has as its main aim genocide prevention. One of their interests is in Kigali, Rwanda.